With Built in check valve like feature. Note: Minimum quantities are required for special thread cuts. Our Hydra Storz I.R.C System (Instant Response Coupling System) is a cold pressed forged made of 6061 Aluminum, heat treated to T-6 with 316 stainless steel butterfly vanes, which opens the storz adapter when water pressure is applied. The Coating on the Hydra-Storz I.R.C System is a MIL-A-8625 Type III anodize. 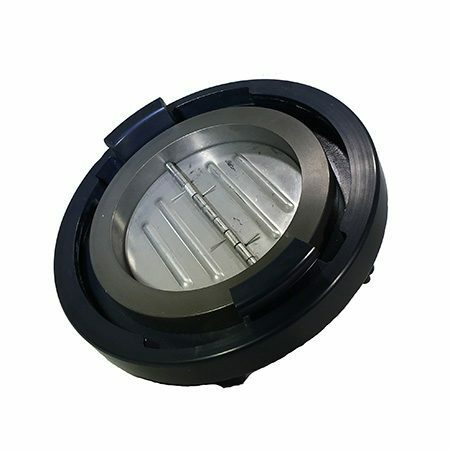 The outer part is hard coat anodized class two (2) with a black color dye additive, while the inner part is a hard coated anodized class one (1) without the color additive process. This coating provides a more durable product finish to help against harsh environments. The benefits of hard coat anodized aluminum would be as follows, corrosion resistance, improved lubrication, increase wear resistance, increase abrasion resistance & non-contaminating. This configuration makes our storz adapter connectors tamper resistant, reduces maintenance costs and is perfect for mutual aid by standardizing the connection to a 4″ or 5″ base. Our Storz connectors can be installed quickly and easily. A whole system can be converted for a fraction of the cost of conventional storz fittings.